Dad said to focus on the future. Mom suggested to take things one day at a time. I didn't think I could do it. Ash was my air for life. Without her, I'd surely shrivel up like a fish out of water and die. I was never going to survive this. Dad shook his head. "You can't keep staying out past sunset. Someone's bound to see you." "Yeah," I laughed. "on this remote side of the lake, I'm sure lots of people saw me and they're running for the tabloids now. Merman removes rock from his pectoral fin in Oklahoma, news at eleven." Everyone had mistaken Galadriel to be the fly, but in all reality she was the spider. 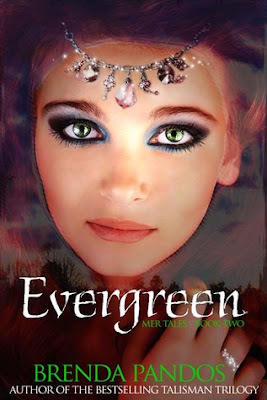 Evergreen is the second book in Brenda Pandos' fabulous and gorgeously imagined Mer Tales. I absolutely adored the first book, Everblue, and was literally counting the days to the release of Evergreen. Brenda Pandos' mermaids and mermen are truly extraordinary and insanely fun to read about. I knew I would love Evergreen just as much as I loved Everblue. I knew this book would be a huge treat. And I knew I would stay up all night reading it, desperate to soak up every delicious detail of Pandos' careful and magical world building. And yet I was still totally blown away when I finally sat down to read it. This book proved to be even better than the first one, even more action packed, exciting, swoon-worthy, dramatic, and addictive! Brenda Pandos made an even bigger splash with this excellent new addition to the series, and boy, did I love it! Evergreen picks up exactly where Everblue left off. Bound together by a powerful mer kiss, Fin and Ash are now forced to endure a long time separation while Fin and his family are on the run for their lives, trying desperately to figure out a way to free Fin's sister, Tatchi. They know that one day they will need to decide which one of them will convert to the other's life, what they don't know is just how soon that moment will come. The rotten, treacherous underwater Kingdom of Natatoria holds many more dark secrets then anyone ever expected. Secrets that will put Fin and Ash's relationship -- and possibly their lives -- in great danger! I said that before and I will say it again: Brenda Pandos world-and-character building skills are extraordinary. There are so many fun little details to the story, so many exciting plot developments, vibrant new characters, moments of absolute heartbreak and longing, amusing dialogues and blood-pressure-rising situations that this book is virtually impossible to put down mid-way. The narrative flow - alternating points of view between Fin and Ash - is so effortless and magnetic, you just can't bring yourself to pause. Whenever the story gets too emotionally intense or too serious, Brenda throws in a humorous back-and-forth between the characters, a hilarious situation, or a clever mermaid joke, and the tension instantly deflates, just so she can build it back up again few pages later! It's a wild roller coaster ride, and you'll need to hold on tight to your seats! Evergreen is even more action packed than Everblue. More is happening -- Fin has some serious problems to deal with, and Ash's life is not drama-free either -- and it seems that something evil is lurking around every corner. At the same time Brenda expands the fictional world -- introducing us to some wicked new characters -- and we get a way better understanding of the mer world, complete with the kingdom's politics and customs. We learn more about the magical bond created by mer kiss, as well as about what happens when a merman loses his fin. The plot is thick with secrets, lies, and longing. There's a feeling of urgency to the story, of time that is running out, of uncertainty about the future. Like I said, it's a pretty intense ride, but also one that is perfectly balanced and very enjoyable. As much as I loved Fin and Ash, I must say that two characters that really stood out for me were Galadriel and Collin. Both of them have very strong, vibrant, interesting personalities and there's more to them than meets the eye. Galadriel is a character that one loves to hate, though at the same time there is something very intriguing about her, a certain dark and dangerous aura that surrounds her, and maybe just a tiny bit cuckoo-crazy to complete the picture. She's strong-willed, bold, sassy, fierce, and often mean and ruthless. I was utterly fascinated by her wild personality! Collin, while trying to appear all manly, irresistible and unbeatable, was in fact quite adorable, especially in his interactions with Ash. I laughed so hard at his failed attempts to enchant Ash with his singing! I had so much fun reading Evergreen, it was a sweet, seductive, adventurous and enchanting novel. A wonderful addition to the series that once again leaves me counting the days to the release of the next book. If mermaid stories tickle your fancy, Brenda Bandos' Mer Tales are the books to go with! Thanks to the wonderful Brenda Pandos we have one eBook copy of Evergreen up for grabs today! To be entered into the draw, please leave a comment with a way to contact you! Additionally, you can win some awesome prizes over at Brenda's blog, including a $50 gift card, signed copies of her books and some awesome swag, so be sure to check it out! I want to participate to this giveaway. I am so glad you loved Evergreen! I can not wait to read it! I absolutely loved the first book in this series, and I am so very glad the second one is great too! Thanks so much for the great review. Oh, I would love to enter the giveaway! I love word play and word building and think I would love this series as a result. You make it sound so interesting! Thanks! I love this series covers! I also love your review writing! you always bring your emotions into it! This cover made me want to read the book even before I read the blurb. Very intrigued! I love stories about mermaids and I'm reading the first book now and enjoying it! Of course I want to get the chance to read this book since it seems great. Thank you for being on the tour! Muah!